Sennheiser is still one of the most respected brands in the business. When it comes to studio headphones, their HD 600 has pushed the envelope to a whole new level. Because of that, this model is probably the very best studio headphones you can find under $300 at the moment. Reputation that surrounds Sennheiser sometimes comes across as overblown. However, just one look at HD 600 proves that most of what you hear is true. They covered everything with this model, from the smallest design details to core performance. The shape and type of frame they have used is nothing new, which is generally a good thing. Why change something it works, right? Then they went a step further. Instead of choosing a black finish like most, Sennheiser went with something that resembles abalone. Headband is meaty and supported with plenty of padding. Interestingly, Sennheiser used textiles instead of standard vinyl to cover the padding on the headband. When it comes to ear pads, they are velour as one would expect. Aesthetically speaking, Sennheiser HD 600 is nothing short of breathtaking. Compared to your standard designs out there, these are a breath of fresh air to say the least. Once we scratch the surface and take a look underneath the flashy exterior, things become even better. Sennheiser went with computer optimized set of drivers that pack lightweight aluminum voice coils and neodymium ferrous magnets. You can get a sneak peek thanks to the mesh grille on the outside of driver housings. With a frequency response range 12Hz to 40500Hz, you know these offer all the range you could possibly need. One thing to note is the impedance. HD 600 are rated at 300 Ohms, requiring a decent amp to drive them the way they are meant to be driven. However, when you’re shopping for this type of headphones, it is implied that there’s an amp waiting for them at home. Cables are detachable but double ended. This is probably the only downside to the entire design. Fortunately, the cable that comes with the headphones works perfectly well. When it comes down to performance, Sennheiser HD 600 shows why they are regarded as some of the best in their class. The response is well balanced with a small amount of bias in certain areas, but ultimately enough transparency. While this might take away a little from clinical output required for proper studio use, it does wonders for spatial definition and staging. With these on, you will have a clear picture of what’s going on in your mix at all times, both in terms of obscure details and spatial awareness. In terms of comfort, Sennheiser did an impressive job with making such a chunky set feel almost feather like. Their padding eliminates fatigue to a point where it is no longer a problem, while the materials used to cover the padding take care of any sweating issues. If you need headphones for long sessions, HD 600 is the answer. Sennheiser’s attention to detail has resulted in a set of studio headphones that meet and exceed all expectations. HD 600 are the definition of open backed studio headphones done right. They offer impressive performance and comfort levels that are hard to imagine the first time you see them in person. For more info about the Sennheiser HD 600, click here. 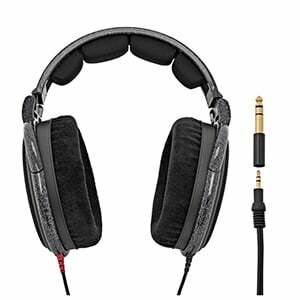 For more Studio Headphones Under $300 you might like, click here.